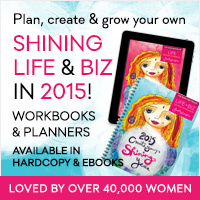 I’m a raving fan and ambassador of these beautiful colorful yearly workbooks! They are so much more fun, artsy, feminine-spirited, color-full than traditional planner workbooks…which I especially love. Imagine being inspired by the artwork as you’re envisioning ahead! 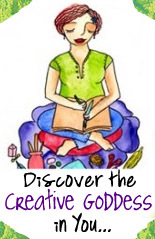 And, I will happily host a ‘Creative goddess workbook party day‘ here for us to do them together–or at least be in close proximity together! All you have to do is ask… Love, love, love! Good stuff. Now shine and sparkle and PLAY! I’m finally going through all my emails from the week post-surgery when I just wasn’t up to being on my computer. I came across this and was compelled to check it out! Since I never know if I’m going to be doing things online or offline, I ordered both the Life e-workbook and the print book as well. 😀 I’m really thrilled! I’m also sharing this on FB and on my SARK groups as well. I intend to make 2015 the best year ever! !